Movie Ramble: Love Like Poison. The 14 year-old Anna Faigueres has returned home from her Catholic boarding school for the holidays to stay with her critically ill grandfather Jean in the Breton countryside. Her mother Jeanne lives there following her devastating separation from her husband Paul. Jeanne takes comfort in the company of the local priest Father Francis with whom she is infatuated. Anna has a special relationship with her beloved grandfather and also grows close to choirboy Pierre, with whom she begins tentative sexual explorations. Anna is preparing for her confirmation, but her budding desire for Pierre forces her to question her faith! Un Poison Violent was a track on the Serge Gainsbourg's 1997 album Comic Strip and the inspiration for this debut feature film from the promising 31-year-old French director and screenwriter Katrell Quillevere. 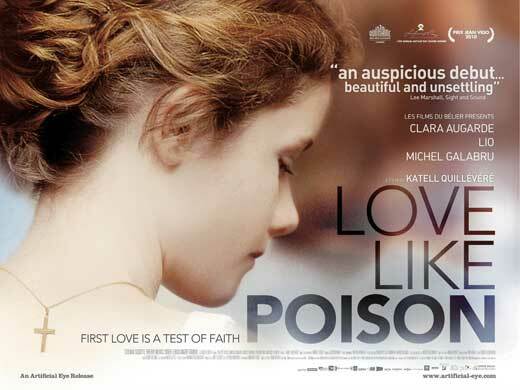 Love Like Poison (2010) is a coming of age drama about a hormonal 14 year old girl. Lee Marshall sums the film up really well when he wrote the following after seeing the movie at this years Cannes Film Festival "With her flame red hair, permanent crucifix and sullen flirty manner, Anna at first looks set to be the underage femme fatale who will snare the keen young village priest. But while the disruptive hormonal force of the adolescent girl is never underplayed the film develops less predictable, more perceptively humane directions" This wonderful movie is equally beautiful and unsettling but coupled with tenderness and a humorous edge, just like the song chosen to play out over the end credits, a choral arrangement of Radiohead's Creep by a Belgian girls choir! This totally convincing gem has an acutely sharp script that adds depth all the characters, which are depicted by a fine set of actors. Including a feature film debut from Clara Augarde as Anna. The attractive Portuguese actress and singer Lio play’ her mother and veteran French film actor 88 year old Michelle Galabru plays grandfather, while the sympathetic village priest is portrayed by Stefano Cassetti. Please note this is how to approach a sensitive subject with style and feeling: highly recommended. Anna confides in Father Francis.